Read CAPE's private school benefits brochure. 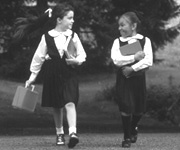 Private schools benefit students by fostering academic excellence and high achievement, educating the whole child within a values-based setting, and preparing youngsters for success in life. If you want a caring, challenging, nurturing, safe and secure environment for your child--a place where he/she can learn and succeed--consider a private school. Private schools are known for the high standards they set. They engage students and spark the desire to learn. Teachers expect excellence from students, and students tend to live up to those expectations. The high expectations and academic rigor help account for above-average levels of student success, including higher college-going rates. If you're looking to help your child reach his/her potential in a school committed to excellence, consider a private school. Private school students are more likely than public school students to complete a bachelor's or advanced degree by their mid-20s (see table). Private school students scored well above the national average in the National Assessment of Educational Progress (NAEP). NAEP scores provide an immediate measure of student achievement, but the report also presents a long-term measure: attainment of a college degree. "[S]tudents who had attended private school in 8th grade were twice as likely as those who had attended public school to have completed a bachelor's or higher degree by their mid-20s (52 versus 26 percent)." And note this: For students from the lowest quartile of socioeconomic status (SES), the advantage of having attended a private school was even more pronounced. Those students were nearly four times more likely than their public school counterparts to have attained a bachelor's or higher degree (table 6). Private school attendance even seems to overcome a parent's low-expectations for a child. "[F]or students whose mother's expectation (in 8th grade) was for them to attain an associate's degree or less, those who had attended private school completed a bachelor's or higher degree at a rate about four times that of public school students (30 versus 7 percent)." The report explains that students from a low SES family who had "completed a calculus course in high school were much more likely than those who had not studied calculus to earn a degree by their mid-20s." It also notes that students in private schools "are more likely than those in public schools to take challenging courses like calculus, and private schools are more likely to require them." Specifically, private high schools require more courses for graduation than public high schools in math, science, social studies, foreign language, and computer science, and the coursework is more likely to include advanced courses in science (chemistry, physic, advanced biology), mathematics (trigonometry, precalculus, calculus), and foreign language (a third year or more). Demanding coursework and high expectations are good for students. As the report states it, "Applying high academic standards--both requiring students to complete high-level, challenging courses and pushing students to strive and excel in their work--is a central schooling component that many experts recommend." The National Center for Education Statistics periodically administers the National Assessment of Educational Progress (NAEP) to test the knowledge and skills of the nation's students in grades 4, 8, and 12. Students in private schools consistently score well above the national average. At all three grades a significantly higher percentage of private school students score at or above the Basic, Proficient, and Advanced levels than public school students. Below are the results from the most recent NAEP report cards in reading. NAEP report cards in other subjects. The following articles provide additional evidence of the high performance of private schools. In February 2012, the Bureau of Justice Statistics and the National Center for Education Statistics released Indicators of School Crime and Safety, 2011, which provides a comprehensive picture of the exposure of students and teachers to crime in schools. While the report's main focus is public schools, a few of its many charts and tables also extend to private schools. The charts below capture the major findings of the report that involve private schools. The following articles provide additional information on school safety. Private schools focus on the essentials--that which provides purpose and meaning to life. The sad reality is that our society is marked by a great fear that fundamental values are coming undone. Within that context, a growing number of parents desperately desire the opportunity to choose schools whose primary purpose is to provide youngsters a sound moral and religious education. Private schools are the only schools we have that can assist parents with the religious and spiritual development of their children--a sphere of development so essential for their complete and proper upbringing.